The opening scene of Behind the Blue Veil, a documentary drawing attention to the plight of the Tuareg peoples of the Sahara desert, is a universal picture of raw human existence set to haunting Tuareg music; two girls are carrying loads through a desert settlement, walking slowly past sand and dead trees, intense sunlight burning through the golden dust. You sense that somehow this isn’t just about them. Long under attack from colonisers, governments, and the advances of technology, the Taureg are now also facing the threat of drug lords and Islamic extremists moving into their territory. Although they too are under attack, this film suggests that the Tuareg are a huge untapped resource for stopping the rise of terrorism in the Middle East. Today there are more than three and a half million Tuareg in northern Africa, divided across five Saharan countries. They’re an indigenous people of the Sahara, a Berber tribe related to the Berbers of Tunisia, Morocco, and Algeria. Though Muslim, their society is matrilineal, and the men are veiled while the women are not. They travel by camel, and these days by truck and jeep as well, and are dependent on the natural world for their sustenance. As is common for highly specialised cultures, the progress of industry has violently upset the very delicate balance of their existence, and countless conflicts within and among the nation states in which they live have threatened their safety as well. The Tuareg tend to be tall, slim, and beautiful, with haunting facial features. Skin colour varies; there are many as pale-skinned as Northern Europeans and others who look like sub-Saharan Africans. They make gorgeous jewelry, music, and clothing, and have a rich storytelling heritage, with griots playing a major role in passing on communal wisdom. Even every day activities are enhanced by a joyful sense of play and artistry that you can see in action as girls rhythmically pound grain, singing happily together. For lovers of roots music, the Tuareg have a profound significance. There is much evidence that early blues music descended from their music, having crossed the Atlantic in slave ships and somehow managing to blossom into a new, but still mesmerising, musical genre in America. Their music has also influenced African genres such as gnawa and rai. Why such a broad influence? For more than 2000 years it was the Tuareg, the herdsman, artisans, musicians, warriors, and travelling salesmen of the desert, who controlled trade in the Sahara. The Tuareg have sought refuge from persecution for decades, forced to accept the agenda of the countries in which they reside as refugees, with, sometimes, disastrous long-term results. The French colonisers exploited them, and then, when Mali gained independence from France 50 years ago, the process of annihilation simply changed hands. 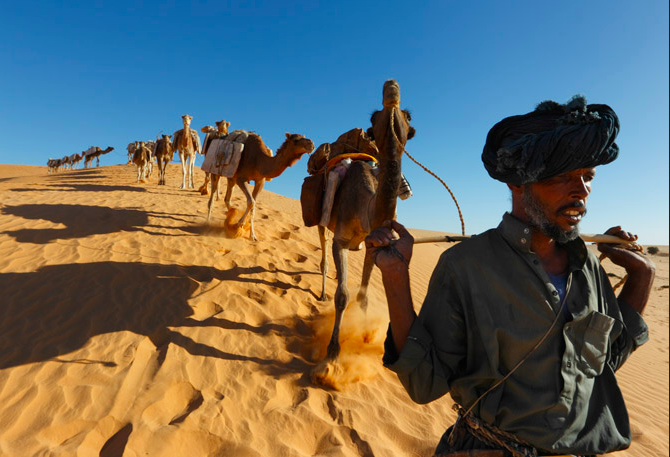 The Tuareg being a nomadic society, with no solid network and no infrastructure, means that governments tend to feel free to ignore agreements, promises, and obligations. In the case of the Malian government, the neglect has long comprised what looks like a slow but deliberate genocide. To make matters worse, the world helps the Mali government—which kills Tuaregs—to fight terrorists, but does nothing to protect the Tuaregs from terrorists. In recent years Islamic extremists have been infiltrating the Sahara, bringing with them violence and the drug trade. The extremists also have an agenda. (I wish I had some of their zeal to get myself out of bed some mornings, because their mission to take over the world seems to be a singular one and they never seem to grow tired of it.) But their agenda doesn’t appear to make room for the creative and deeply spiritual Tuareg—Muslims of an entirely different order. The documentary loses points for not showcasing more of Tuareg music, but gains for being such a feast of intense external and internal beauty; there is a mysterious shining from within every scene and, amid the despair, there’s the sense that here is something so incredible that it just can’t die. Kudos to Robyn Symon for her use of documentary film to bring awareness to the plight of cultures in crisis and for creating FACES—the Foundation Advancing Cultural and Economic Survival, Inc., an organization for preserving endangered cultures.